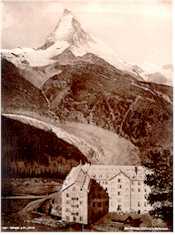 The new Riffelalp Resort is a five-star successor to the Riffelalp Grand Hotel, whose guests ranged from royalty to Rockefellers. In late November, 2000, a fax arrived in our office. It was an invitation to a weekend press conference at the new Riffelalp Resort in Zermatt, Switzerland, which was about to open for its first season after several years of planning and construction. What made the press conference interesting was the story behind the new resort: It was the result of a partnership between the Seiler family (whose ancestor built the original Riffalp Grand Hotel in 1884) and the Sandoz-Family Foundation, which invested more than 50 million Swiss francs in the project with the aim to "preserve, or revive, a splendid example of Swiss economic history." Most of the old luxury hotel had been destroyed by fire in 1961, and now--almost 40 years later--a smaller, more intimate, yet equally luxurious successor was rising from the ashes at a time when traditional resort hotels are often viewed as an endangered species. Cheryl was unable to accept the Riffelalp Resort's invitation on such short notice, so I went alone. The results of my trip include an illustrated article on the new resort, an official history of the old hotel, personal observations in the form of "reviewer's notes," and photo galleries of the Riffelalp Resort, the surrounding ski slopes, and Zermatt. I've also used this opportunity to update our existing articles on Zermatt.